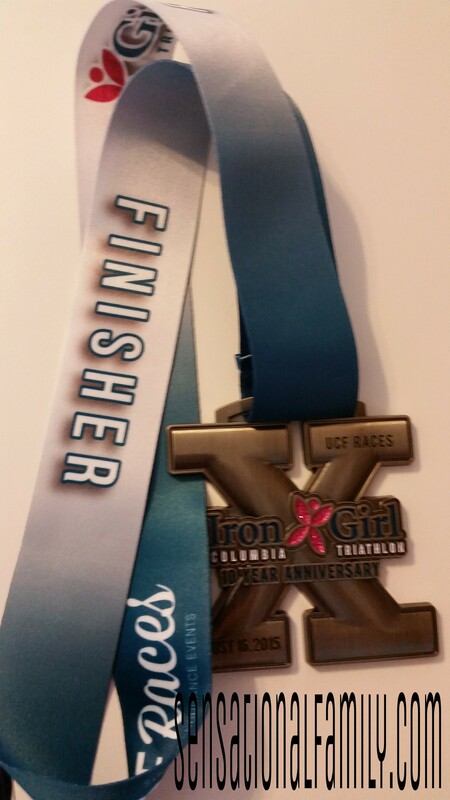 Sunday I competed in an Iron Girl sprint triathlon. I use the word “competed” lightly, for really, I finished it. I finished in the top 50% of all competitors, but I was not close to winning or even in the top 100. As I crossed the finish line, a very nice volunteer hung a medal around my neck and I couldn’t have been more proud or more relieved to get that medal. It meant I was done, it meant that my hard work was acknowledged. I earned that medal. I didn’t win it, but I did earn it. Then I came home and scrolled through Facebook because I couldn’t move anymore and it seemed like the thing to do, and I saw an article being shared about James Harrison (Pittsburgh Steeler) taking his children’s participation trophy and people were applauding him. Then I thought, “I just got a participation trophy” and in my dehydrated over-stressed state, I got a little mad. I thought about all the trophies I had received over the years. They range from participation to first place trophies for multiple sports. I thought about how proud I was when I received the trophy for winning and how receiving the “participation trophy” was nice to receive. It was something I had to remember the season by and how I in no way confused getting that trophy for the first place trophy. Now, concerned that I was just letting my exhaustion get the better of me, I dug out my old trophies and had an experiment. Here are said trophies… (and counter clutter in my house). 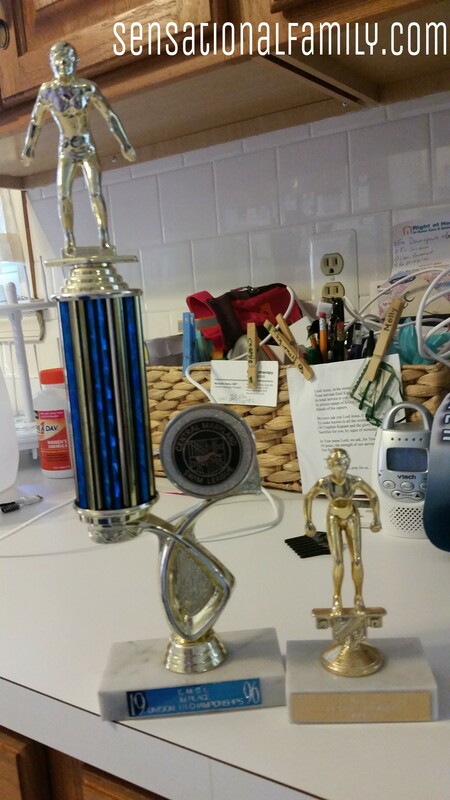 Both are from my 1996 summer swim team (yes, I still have trophies I won in 1996). The big one I received for winning the girls 15-18 100 meter freestyle at the championship meet, the smaller I got for being part of the team. Then I gathered the children. A 6 year old autistic child and a 4 year old and I asked them which one they would rather have. Both said “the big one”. Then I explained why I received each one and asked which was more important and again they said “the big one” so I went one step further and asked if they got the small one, which would be given to everyone, would they think they won something and they both said “no”. And Molly even said “I got a trophy for playing soccer, but I didn’t win” ok, so they get it. Just as I got it as a kid. And in case you missed it, they were giving out participation trophies in 1996 and actually I found one from 1992, so this is not a new phenomenon in an attempt to wussify our children. In fact, a lot of these parents that are praising James Harrison, are also people that received a participation trophy. I know, because I stood along beside them as a team mate. I continued to think about this over the next 24 hours. I thought about how no one is trying to take the medals I received for running races in my adult life. I thought about how no one is saying that I don’t deserve them. Why not? It’s the exact same thing. I didn’t win any race I’ve ran as an adult, but over half of them I earned a medal for. And, yes, I believe I earned them because I trained for them and fought every step from the starting line to the finish line. I started to think what I hope my kids learn from watching me train and compete. I lose races and I get back up and hit the road or the pool for another workout and compete again. I hope I’m teaching them perseverance and how my perseverance earns recognition. I continued to think about how people say that we are doing our children a disservice by not allowing them to lose. I disagree, I don’t see how complimenting and rewarding hard work, commitment, and team work is a bad thing. Those are all the traits that make people better, not winning. I did not get a job as an adult based on my ability to win races as a child, I got a job because of the lessons I learned from participating. I think where we go wrong is confusing the terms “earn” and “win”. Winning something is not the same as earning something. Winning is achieving victory, earning is gaining something from work or service (thank you Google). They are not synonyms. Kids can earn a trophy by working hard throughout the season and they can learn what it means to lose and stand tall in defeat. The message is important. The recognition symbolized by the trophy is important. Positive reinforcement is important. I want my kids to know that their work is worth something. That the time and effort they dedicated is important. That even if they didn’t win, they are still better people for trying.